1. The model is male upper body model with correct sitting position,vivid image,soft and flexible skin tissue. 2. The model has normal lacrimal anatomical deconstruction, including lacrimal canal, lacrimal duct,and nasolacrimal duct.The canaliculus can be changed according to the actual needs of the operation,as the angle of the needle is inserted. 3. Simulate the lacrimal irrigation operation,when the flushing operation is correct,the liquid flows out from the nasal cavity or the oral cavity. 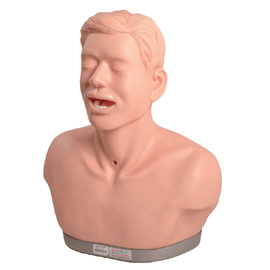 According to the training and assessment needs, the simulated pus can be added to the simulated lacrimal canal to perform the flushing operation training after the lacrimal passage obstruction.